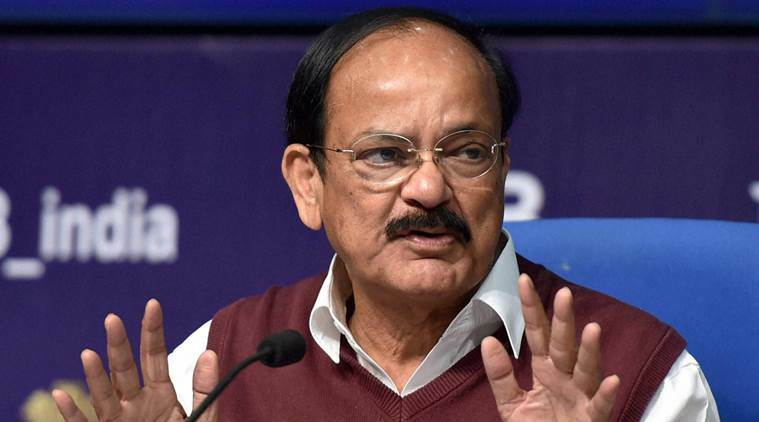 New Delhi : Senior Bharatiya Janata Party (BJP) leader and Union Minister M. Venkaiah Naidu on Sunday met Union Food Minister Ram Vilas Paswan and held discussions over the Presidential election. Naidu, after the meeting, told the media that the name of the Presidential candidate would be announced before June 23. "The decision will be taken soon and the name of the Presidential candidate will be announced before June 23," Naidu told media here. "Paswan went to London for his treatment, and we all were waiting for him to come back. Now, he is absolutely fine. I have informed him about everything happening in the connection of presidential elections. He told me that his stand is clear and whatever Prime Minister Narendra Modi decides will be acceptable to us," he added. Later, he will meet Union Home Minister Rajnath Singh. "Rajnath Singh has suffered some sprain in his feet this morning therefore I am going to meet him. Everything will be done on time. On June 24, the Prime Minister is going abroad so decision has to be taken before that," Naidu added. Union Home Minister Rajnath Singh and Naidu on Friday met Communist Party of India (CPI) leaders D. Raja and Sudhakar Reddy at the latter's party office over presidential elections. Speaking to the reporters, CPI leader Sudhakar Reddy said, "On behalf of the three-member committee of the Bharatiya Janata Party (BJP) -- Rajnath Singh and Venkaiah Naidu met us today after meeting various political parties, but didn't make any particular proposal. They only wanted a 'consensus candidate' asking who would be best suited. Only after being proposed by the government or by the ruling party, we can take a decision." Meanwhile, AIADMK leader M. Thambidurai has said, "The party will meet soon and announce support to the Presidential candidate. We are friendly with the Centre, but not in alliance with anyone." Naidu has also spoken to Janata Dal (United) leader Sharad Yadav and Samajwadi Party (SP) leaders Ram Gopal Yadav and Naresh Agrawal over phone and met Samajwadi Party patriarch Mulayam Singh Yadav and senior Bahujan Samaj Party (BSP) leader Satish Chandra Mishra in this regard. According to reports, the BJP committee is holding discussions with all parties as they are trying to finalise a consensus candidate for presidential poll before Prime Minister Modi departs for foreign tour on June 24. Congress leaders Ghulam Nabi Azad and Mallikarjun Kharge, JD(U) leader Sharad Yadav, Rashtriya Janata Dal (RJD) leader Lalu Prasad Yadav, CPI(M) leader Sitaram Yechury, TMC leader Derek O'Brien, Samajwadi Party's Ram Gopal Yadav, BSP's Satish Chandra Mishra, DMK leader R. S. Bharathi and NCP's Praful Patel are part of the sub-group. The election for the next President of India is to be held on July 17 as President Pranab Mukherjee will demit the office on July 25.